Last week I posted about the DIY PID-Controlled Soldering Hotplate I designed and built to improve my surface mount soldering capabilities. I mentioned one issue I was having with the hotplate on flickr. 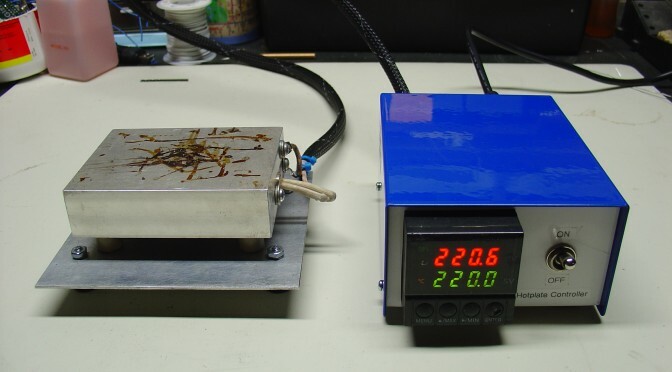 Specifically, the aluminum baseplate was getting too hot for comfort (literally) when I set the hotplate to solder reflow temperatures (180-220C) for more than a few minutes. At the time I thought it was due to radiant heat from the upper aluminum block transferring to the bottom plate. I later discovered that the ceramic spacers I used to hold up the hotplate were much more thermally conductive than I thought and the screws I used to attach the baseplate to the spacers were burning hot before the rest of the baseplate. It was conducted heat, not radiant, that was the primary cause of the problem! I was able to resolve the issue by reducing the diameter of the ceramic spacers from 1/2″ to 1/4″ and using all stainless hardware to attach the spacers. Now the baseplate stays relatively cool even with the hotplate at high temperatures for long periods of time. Click on the pictures below or view the complete set on flickr. In preparation for my Arduino-based AVR HV Programmer boards coming back, I decided to step up my home lab surface mount soldering capabilities. Step one was to find a cheap stereo zoom microscope on ebay, with 7-32X magnification, perfect for working on surface mount devices. One of my biggest frustrations in the past is that with a cheap magnifying ring light, I can’t actually see what I’m working on – not any more! I’ll post some photos of the microscope when it comes. Step two was to build a soldering hotplate. I like using a hotplate for surface mount soldering because you can actually watch the board as the solder paste reflows, and manually add/remove/nudge components around with a set of tweezers. This is great for engineering work where you may still be making component changes and other tweaks to the board. Mass production is probably best left to a reflow (aka toaster) oven. 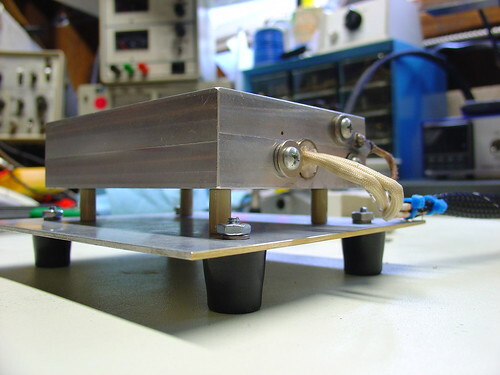 I posted a few photos of the hotplate on flickr, which ended up on Hackaday. The heater is a 1/2″ 500W, 120VAC cartridge heater I bought from McMaster-Carr for about $25. The hotplate itself is a 3x4x1″ chunk of aluminum that I machined with a carefully sized hole just below the center for the heater to slip into, as shown. A type-K thermocouple (top right) measures the temperature and provides a signal to the controller. Ceramic standoffs insulate the hotplate from the bottom aluminum baseplate. For safety, there is also a ground strap, shown on the bottom right. This the second PID controlled project I have done, the first was my PID Controlled Solder Paste Fridge. 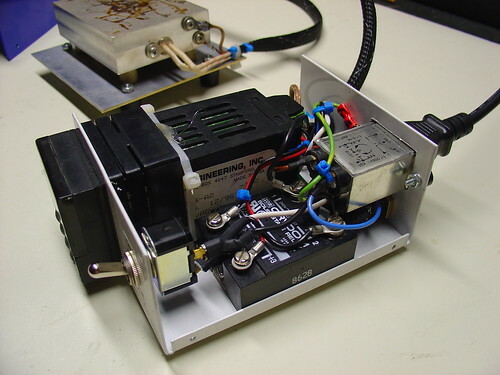 The controller box contains an Omega CN77000 series PID controller and an IR/Crydom 240V 40A (overkill!) D2440 Solid State Relay (SSR), along with a power switch, fuse, and power connector. The PID controller and solid state relay were both found at a now-defunct Silicon Valley surplus store for a few bucks each. A 3′ umbilical cable connects the controller to the hotplate. 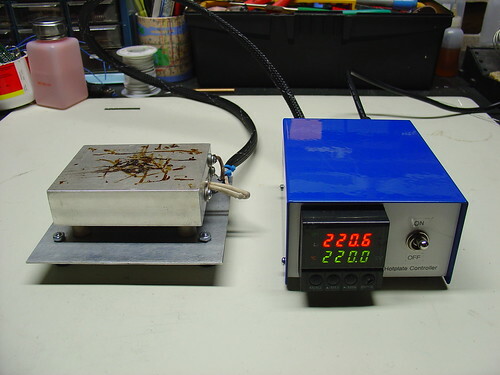 60/40 leaded solder reflows at about 185C, and lead-free solder is around 200-230C depending on the alloy. (Wikipedia has a good list of reflow temperatures.) The hotplate can easily reach these within a minute or two from room temperature and could get much hotter if necessary. 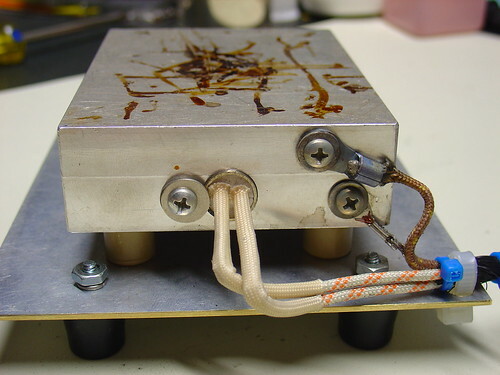 It can also be used to cure epoxy and perform any other tasks that require a precisely controlled heater – this could be the world’s most overengineered coffee warmer, if not for the dangers of lead poisioning. Update: I just posted some more information about the microscope.